This past weekend we drove into a rather remote section of West Virginia to "rough it" in a pioneer cabin in Seneca Forest State Park. What's a pioneer cabin, you ask? Well, it's a tiny little cabin that has no running water or electricity, no heat and no air conditioning. Kind of like camping, but with more room for little boys to play on a rainy day than a tent would offer. Below is a picture of our cabin. Note the outhouse in the left corner (they call them vault toilets now - I guess the term outhouse is out!). Pierce checked out one of the two bedrooms. Simple and sparse - just right! Everything you needed was hanging on the wall. 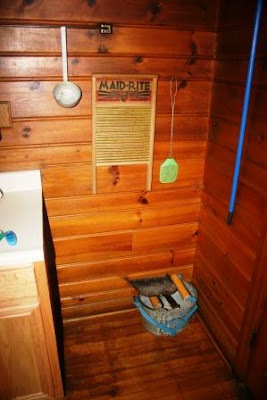 I'm glad I didn't actually have to use the washboard or the wringer thing (located on the floor, beneath the dustpan). I'm actually not even sure I could've figured the wringer out if I wanted to! 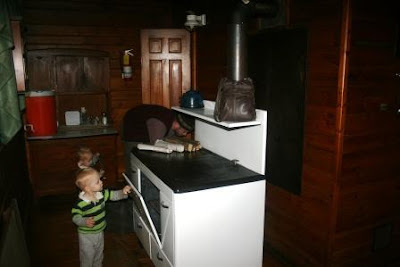 There was a woodburning cookstove in the "kitchen". We were unable to figure out how to get it to draw very well (smoke filled the room, smoke detectors went off, and Paul finally doused the fire with several sippy cups of water at my insistence). After talking with the ranger, it sounds like that is standard for this type of stove, and you just have to push through it until you get a big enough flame that it starts to draw. Where the water comes from - icy cold, but it did have an iron flavor to it. They had lights that run on propane in the cabin, so you just have to light them. 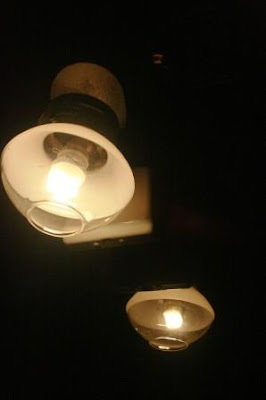 They are not bright like electric lighting, but they do shed enough light that you can walk through the cabin in the evening without running into things. or just played like they were! The first morning we headed out fairly early (after the smoky wood cookstove FAIL) to head up a little trail to a fire tower. After noting that several steps were missing, I elected not to climb it, and didn't want the boys to climb it either. Of course Paul had to climb it anyway. And he took this picture from the top. After this we headed back to the cabin to get geared up for our big adventure - the whole reason we took this side trip to WV. Stay tuned! I love your cabin. It's looks like a lot of fun. 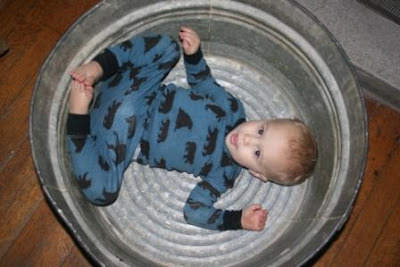 The pictures of the boys in the basin are darling! Too cute. I can't wait to hear more. LOL.. I used to love doing things like this. Now, I want my own bed in my warm house. Perfect trip for boys!... me? Not so much. I need a convenient bathroom. OH that is someplace I would love to go with just Hubby. Though I would probably have issues with the wood kitchen stove too. 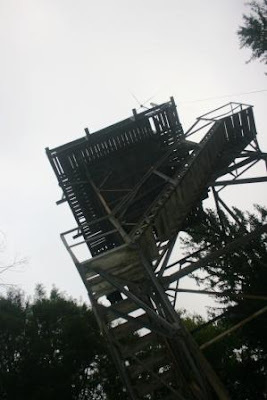 My hubby would do the fire tower while I stayed safely on the ground as well. Looks like ya'll had a ball. Umm did you know your background is gone?? Ice cold water sounds fantastic! It is so hot here in the summer that even the cold tap water is hot. I tire of brushing my teeth with hot water....Yuck! I love places like that. I think it is peaceful to spend a weekend without electricity. 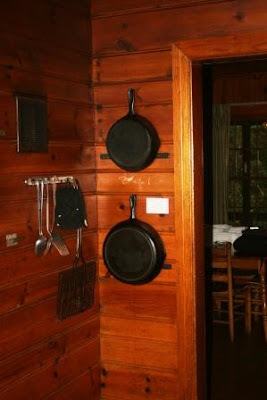 i love the rustic-ness, but the lack of a good cookstove would wear thin in a few hours. :) can't wait to hear/see more! this looks sooooo fun BUT i am more of a "room service" kind of girl!! 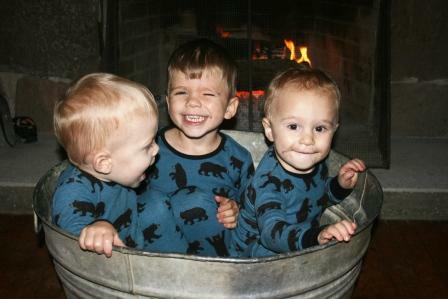 your boys are adorable and that washtub picture is fabulous!! you are making the best kind of memories!! I can't wait to see the rest!!! I think my favorite pictures are the boys in the rockers and the last one! No wait, make that the boys in the big basin, that should go on your Christmas card or be framed!!! That was so rustic and adventure-filled! You do the coolest things! What an adventure! I don't think I would know how to get a draft. I've always wanted to rent a cabin in Rocky Mountain National Park--looks like you had a great time. Girl - great for you Marriott for me! You didn't mention the toilets. No kidding - the boys looked like they had a great time! 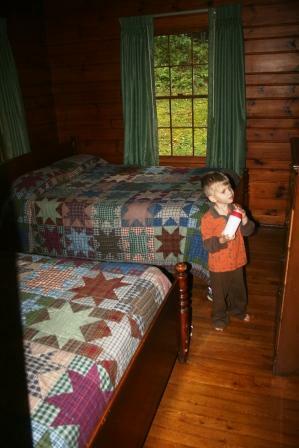 LOVE the rustic-ness of the cabin! THere are some places up here near lake Tahoe that are just like that and I just LOVE the simpleness. Can't wait to hear more! What a great place to take little boys! I hope you packed your own water - or do next time. Can't wait to hear about the next big adventure! 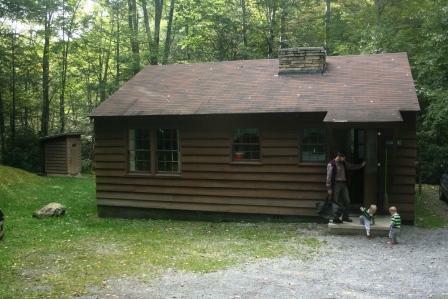 I didn't even know they had cabins like that in West Virginia! 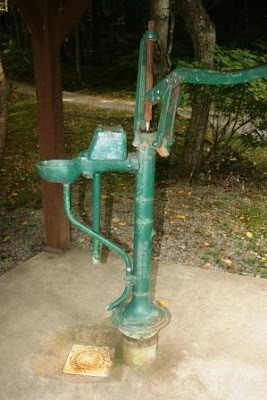 lol You were living like the true pioneers did back in the day! 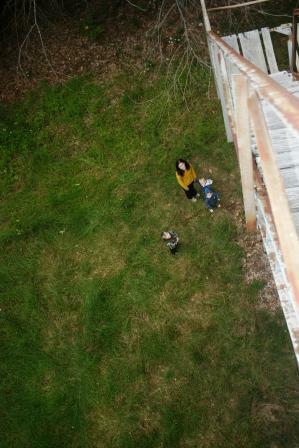 Can't wait to see more pictures from your adventures! 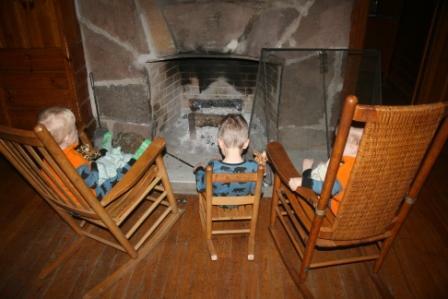 The tub pictures and the rocking chair pictures are too cute! I agree this is a great post and it really does show how much fun you can have doing simple things together as a family!! Love your blog!! We haven't camped in cabins for a few years now since they seem to be more expensive than hotels! But we used to go at least once a summer and the kids loved it. That looks like so much fun! I love the picture of the boys in the wash basin!